Be descriptive! What format? Where at? 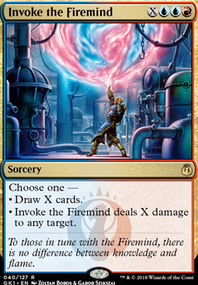 Build your experience counters early with Mizzix, create a bunch of mana with Inner Fire , Mana Geyser , Turnabout , Seething Song and/or Reality Spasm then close the game by playing and copying one of the X cost burn spells or just with Enter the Infinite and Jace, Wielder of Mysteries . The point of this playstyle is just to see how much damage you send flying at your opponents' collective face. While the deck can very much start comboing out on turn 4 that isn't in the spirit of why it was constructed. You wait. You bide you time. And when the stars align, you nuke the entire table for hundreds of damage over and over again until nothing remains but a pile of ash for you to stand on. Any suggestions are more than welcome, as long as they won't break the bank. 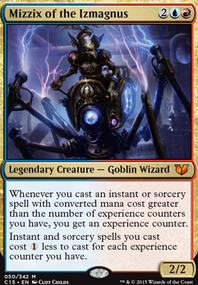 There are a few restrictions - no extra turns, no tutors, and no infinite combo win cons.